The formation of somites (somitogenesis) happens quite early in embryogenesis and proceeds from the tip of the embryo (anterior) towards the tail (posterior); each somite forms when a block of cells splits off from a large mass of tissue called the “presomitic mesoderm” (PSM). While somites pinch off from the anterior end, the PSM elongates towards the posterior. The relative rate of these two processes determines the size of the PSM. If the PSM is growing more quickly than somites are forming, it will become larger; conversely, if somites are leaving more quickly than it is growing, the PSM will shrink. Somitogenesis usually ends when the growth of the PSM slows down and it is fully consumed the formation of somites. In order for somites to form properly, the cells at the anterior end of the PSM need to know when to split off. This process is thought to be regulated by a mechanism known as the “clock and wavefront model”, first proposed by J Cooke and EC Zeeman in 1976. The model describes an interaction between a wavefront which moves through the PSM and a ticking clock in each cell which determines its ability to respond to the signal given by the moving wavefront. 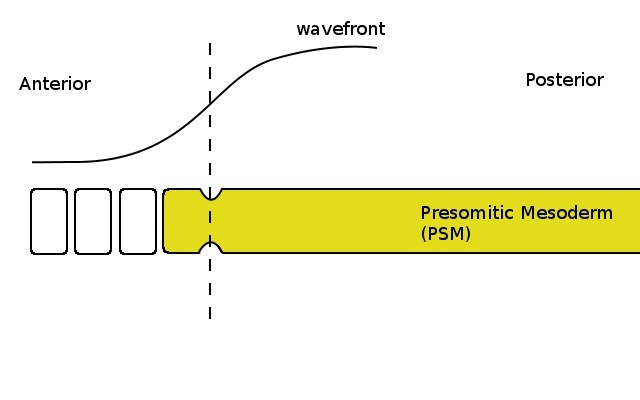 The wavefront is a gradient of a chemical (later found to be a growth factor, FGF) which is produced at the posterior end of the PSM, leading to a high concentration at the posterior end and a lower concentration towards the anterior. When the concentration of FGF is low enough, cells undergo several changes which cause them to break off from the PSM; in other words, cells with less than a certain amount of FGF are able to become somites. Since the concentration increases towards the posterior PSM, only the cells at the anterior end will have a concentration below this threshold. 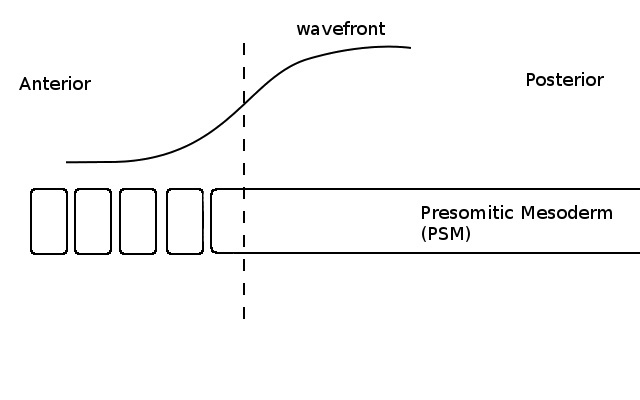 The wavefront is carried along by the PSM as it grows towards the posterior end; the moving wavefront determines a region (towards the anterior) where cells have a sufficiently low amount of FGF to be capable of forming a somite. The “determination front”, the point at which cells will be below the threshold, moves back from anterior to posterior along the embryo’s axis; cells anterior to the determination front are capable of forming a somite. If this were the only factor involved, cells would try to pinch off as soon as the determination front passed them, resulting in the disintegration of the PSM rather than the formation of discrete somites at regular intervals. A moving wavefront isn’t enough to properly generate somites since it sweeps back along the PSM in a continuous manner and somites need to form at regular, discrete intervals. In order to translate the continuous signal provided by the wavefront into discrete intervals, another component is needed: the ticking somite clock. The somite clock is an internal clock in the cells of the PSM; it can be seen through the cyclic change in the expression levels of certain genes. Only cells that are at the correct point in this cycle have the correct genes expressed to make them capable of responding to low levels of FGF; when cells are in a different phase of the cycle, they are unable to respond to low levels of FGF. For example, a clock which oscillates every 30 minutes would result in all of the PSM cells being capable of responding to low FGF levels only once every 30 minutes. 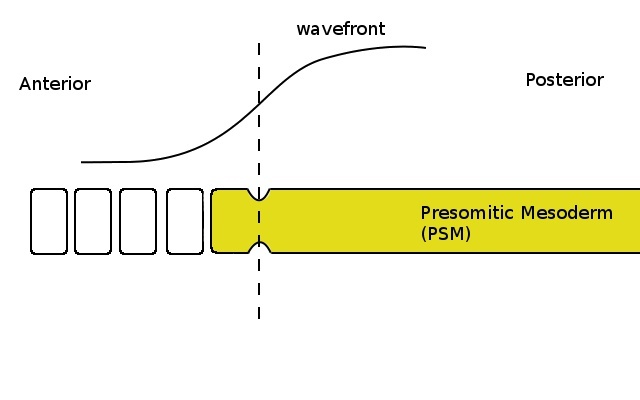 The interaction between an oscillating temporal signal and a mobile spatial signal is able to co-ordinate the regular formation of discrete somites from the PSM; the ticking clock acts as a gate for the signal carried by the wavefront, allowing cells to respond to it only periodically. In order to break off and form a somite, cells must be at the correct point in their internal clock cycle and be in the correct position in the PSM to have a sufficiently low level of FGF. The wavefront determines where along the PSM a somite can form and the clock determines when the somite actually forms; together, the cyclic temporal signal and the continuous spatial signal are capable of generating a discrete spatial pattern at regular intervals. Cells with a low enough concentration of FGF (shown by the curve at the top) pinch off to form a somite when the clock is in the correct phase (yellow colour in the PSM). The determination front, where the FGF concentration becomes sufficiently low, is shown by the dashed line. As the PSM grows towards the posterior (not shown) the wave and the determination front move with it. Although some cells are now below the critical threshold (ie, left of the dashed line), they do not form a somite because the clock is in the wrong phase (no colour in the PSM). When the clock is again in the correct phase (yellow colour in the PSM) the cells which are below the critical threshold (ie, left of the dashed line) pinch off and form another somite. The clock-and-wavefront model has received a good deal of experimental support over the last 15 years; it seems likely that this mechanism regulates somitogenesis in most vertebrate species. However, the number of somites (and so the number of vertebrae) formed by each species is different; for example, humans have 33 vertebrae, while chickens have 55, mice have 65 and snakes can have as many as 500. An obvious way to generate different numbers of vertebrae would be for the process of somitogenesis to continue for longer in some species than in others, thus generating more somites. However, in 2008 a team of scientists published a study showing that this wasn’t the case. Céline Gomez and her colleagues studied somitogenesis in the embryos of zebrafish (which have 31 vertebrae), chicken, mouse and corn snakes (which have 315 vertebrae) and found that the process lasted roughly the same number of cellular generations in the mouse, chicken and snake, despite the wide range in the number of somites formed. (Interestingly, somitogenesis was much shorter in the zebrafish, suggesting that fish and their land-based descendants may use different mechanisms to determine how many somites they develop.) The researchers also observed that the somite clock ticked at a different rate in each of these three species. Surprisingly, the period of the clock didn’t seem to correlate with the number of somites; somites formed once every 90 minutes in chickens, compared with once every 100 minutes in the corn snake and once every 120 minutes in the mouse. The apparent discrepancy results from the fact that the periods are being reported in absolute time rather than developmental time. In order to properly compare the clock rate between different species, the periodicity should be measured relative to how quickly the embryo develops. When the researchers compared the time embryos took to reach certain conserved developmental landmarks, they found that corn snake embryos developed over three times more slowly than the chicken embryos. Comparing the snake with a lizard which develops at a similar rate showed that the period does in fact correlate with the number of somites formed; the lizard, with only 90 somites, had a clock period of roughly four hours. In order to compare the rate of the somite clock in the four species they studied, the researchers calculated the period of the somite clock as a fraction of the the average cell cycle time of the PSM. By doing this, they were able to measure the clock rate in terms of developmental time. When the periodicity is properly normalized against development, it turns out that the corn snake’s clock ticks about four times faster than that of the other species. Snakes are able to generate more vertebrae than other animals by forming their somites more quickly (relative to their development), not by continuing to form them for a longer time. In fact, somitogenesis takes approximately the same number of cellular generations in snakes (21) and mice (17). Somitogenesis is just one of the many process that need to be correctly regulated during development. In fact, even the picture given here is an over-simplification; current research suggests that there is a second gradient in the opposite direction of FGF (anterior to posterior) which sharpens and reinforces the spatial signal. Nevertheless, the basic dynamic described by the clock-and-wavefront model demonstrates how coupling between different modules can generate patterns in time and space; it’s also an excellent example of a proposal from theoretical biology which was later borne out by experimental research. 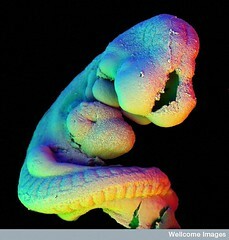 Embryogenesis requires the proper spatial and temporal co-ordination of somitogenesis with a variety of the other processes, such as the mechanisms which determine the identity of each segment. Understanding morphogenesis, the development of form, represents a major challenge to modern biology and is a fascinating and active area of research, as well as an intellectually stimulating subject. Although we’ve been making impressive progress, research like this often seems to pose as many questions as it answers, reminding us that we’ve only taken the first steps of discovery in this grand journey. The sentence “cells undergo several changes which cause them to break off from the PSM” is highly suggestive of an epithelial-mesenchymal transition, where intercellular junctions are lost and the tissue becomes loose. According to Baker et al, however, the drop in FGF8 (the wavefront) causes cell arrangement to change from “loose mesenchymal” to become “more compact”, in order to initiate the “epithelialization process underlying somite formation”. Based on this, lacking a ticking clock, the entire PSM should become more compact as the wavefront advances, rather than disintegrating as you wrote. In other words, while you describe the “pinching-off” event as a type of active consequence of the wavefront passage, Baker et al. appear to imply that the “pinching” results from lack of the compacting effect of FGF8 drop, whenever the clock is out-of-sync.